As the mom of a 4 year old, 7 year old and 9 year old, there is no shortage of knock-knock jokes in my house. In fact, I often hear the same jokes over and over again, all in a row… it’s hard to be annoyed though when even the same old jokes make these kids erupt in peals of laughter like they’re hearing it for the first time. Aww, don’t cry! It’s just a joke! Cute, right? We love jokes around here, and we needed to change it up a bit, so I was excited to show my kids the Haha Color-Me! Joke Book, a new social joke book by Neesha Mirchandani. As it happens, these two jokes are actually in the book, along with a slew of others that were new to us. One of the jokes made my husband groan out loud, which is hard to do! I read some of the jokes with my youngest during a quiet moment, but handed it off to my 7 year old one bedtime. We read the jokes together but really, I wanted her to stay in her room and chill out so she could fall asleep. I proffered some crayons and she got busy coloring while I sashayed casually out the room, lest she catch on. The book has not left her room since. She keeps it by her bed, and I often find her going through the book during a quiet moment. What’s equally awesome about this coloring book is that , for every PRINT book Neesha sells, she will be sending one to a child in need who can’t afford one. So when your child laughs, you know you’re sharing the laughs with another child. I also signed up for the Make Your Kiddos Laugh for 5 Days Straight challenge. It’s super cute and features the HaHa Laugh Bot. Try it out today! 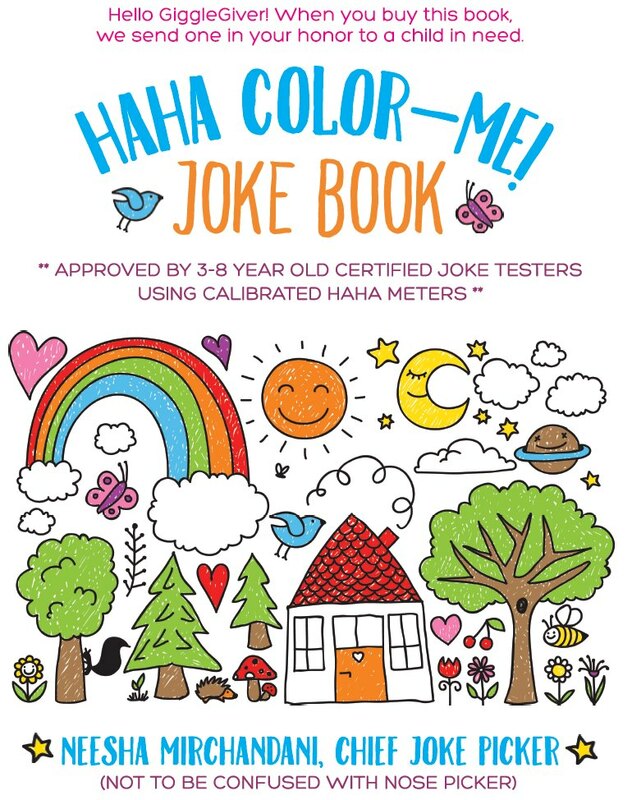 The book launches on October 17th and to celebrate, I’m giving away a free copy of the HaHa Color-Me! Joke Book! Use the Rafflecopter below to enter. Our home loves the interrupting cow joke waaayy too much, as well!